Who Needs God When Life is Good? I’ve been there. Life is sailing along. Sure, there are some bumps in the road here and there but nothing traumatic. Congratulations, you’re winning at life! Then, something happens. Maybe it’s a lost job or a bad diagnosis. Maybe it’s a broken relationship that doesn’t seem like it will ever heal. Suddenly, you don’t feel like you’re winning at life anymore. You turn to God in your time of trouble. And He’s there for you. He sends you help in some form — perhaps through the gift of inner peace amidst chaos, perhaps through a supportive friend, perhaps through a more direct solution to your immediate problem (a new job opportunity, a gifted doctor to see you through your treatment, an opportunity to mend that relationship …). I’ve been guilty of this so many times. I’ve called out to God for help in desperate times but forgotten about Him when things are good. I’ve been the fool who believes in the illusion of control that I think I have over my life and taking credit for “my” achievements. When I do that, I’m forgetting that my relationship with God is all based on love. He loved me (& you) into existence just for the purpose of loving us and giving the opportunity to love Him back. When I use God as a storehouse of help, not as a companion or a friend, I turn into a foul-weather friend — only there when I need something from Him and not because I just want Him in my life. Where is the love in that kind of relationship? The challenge I have is to remember to stay close to God even when I don’t think I need Him. And here’s the surprise. The “good life” that I think I have isn’t nearly as good as it could be with God in my life. It’s like going in for your yearly checkup feeling fine and finding out that your cholesterol is sky high. You had no idea it was a problem. You thought everything was going great and that you were healthy. But then you get help to get better, and, surprise, you feel better than you ever did before the physical. It’s the same with God. Your “good life” is nothing compared to what it could be partly because you don’t even know that anything is missing from your life. God sees where you need help even if you’re blind to it. And He knows your life could be so much better than it already is. When life is hard, we need God. 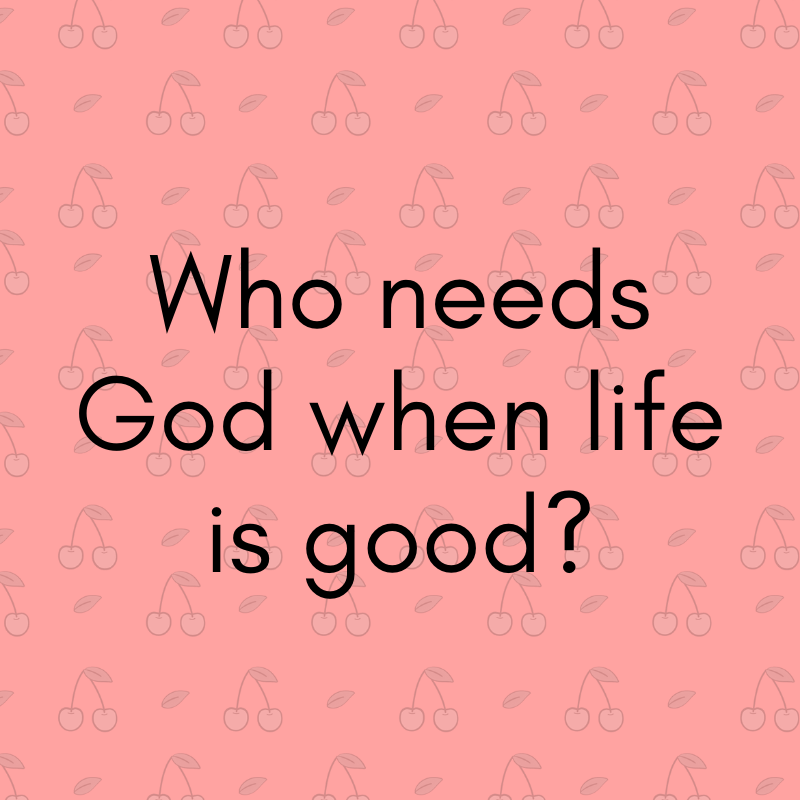 When life is good, we need God. Even when we don’t know we need Him, we need God. Image Copyright: Laura B. Nelson. All rights reserved.